Whenever I suffer from hair fall, I always reach out for hair oil instead of shampoos and conditioner. Hair oil must be applied at least twice a week for shiny, black and healthy hair. Old Wives Tail is a UK based hair care brand that aims at providing natural and luxurious hair care products to its customers. 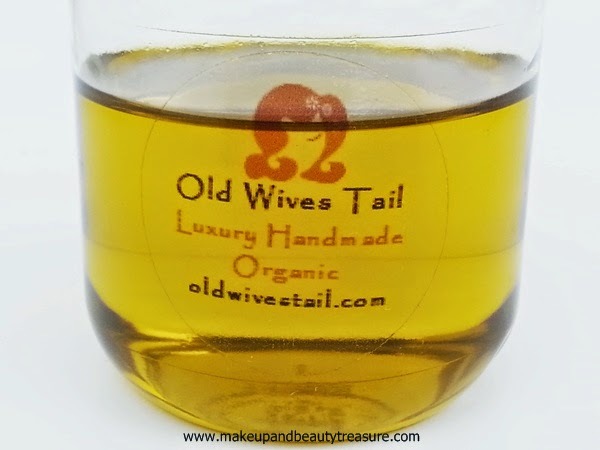 Today I am going to review Old Wives Tail Anti Hair Loss Hair Oil. A healthy scalp is vital for healthy hair growth. If you suffer from a dry, itchy scalp just a few drops of SOS will soothe, moisturise and soften your scalp to prevent hair loss. This 100% organic oil contains natural anti-bacterial agents that soothe and heal scalp infections and remove dead skin cells. SOS has stimulating properties that increase circulation and encourage healthy hair growth. Directions for use: Massage deeply into the scalp, in particular on the most dry areas. Smooth over the rest of your hair to strengthen each and every strand root to tip. Leave on for one hour. Rinse with fresh water and shampoo. Repeat this process until your hair feels clean and product free. After shampooing you can use conditioner on the ends of your hair only. Rinse out thoroughly and style as normal. For best results leave the treatment on over night and wrap your hair in a warm towel. 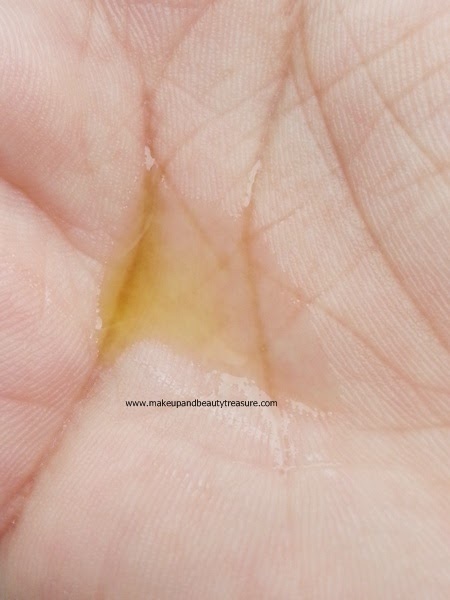 Do not apply the oil to any open wounds or cuts on the scalp. Store in a cool, dry, dark place - A cupboard in a ventilated bathroom is fine to store your hair treatment. Contents: Olea Europaea (Olive) Fruit Oil, Persea Gratissima (Avocado) Oil, Prunus Dulcis (Almond) Oil, Lavandula Angustifolia (Lavender) Oil, Mentha Piperita (Peppermint) Oil, Eugenia Caryophyllus (Clove) Flower Oil. If you have allergies to any of the natural contents please do not use. 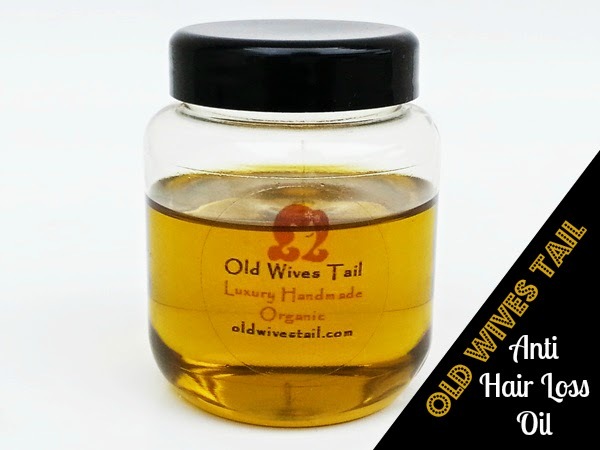 Old Wives Tail Anti Hair Loss Hair Oil comes in a sturdy clear plastic jar with a black screw top lid. It comes sealed with a thin and smooth plastic wrapper with all the information written over it. It was filled to the brim but customs people opened the lid and did not screw it back leading to spillage of oil in my package. The package is quite light but I wish it was available in bottle with a flip top lid so that I can carry it with me even while traveling. The hair oil looks dark yellow in color with a lovely mixed scent of lavender oil and peppermint oil. The scent is a bit strong but is really soothing to the senses. The consistency of the hair oil is perfect. It is neither very thick nor very runny. It is quite light and does not feel heavy or greasy. Instead of warming it up, I apply it directly onto my scalp and hair. I then massage it gently using my fingers and leave it overnight to get utmost results out of it. The scent does not tend to intensify and remains mild. I feel it penetrates the hair shaft and not just coat the hair. The hair oil is easy to rinse and does not leave my hair greasy or limp. My hair feels soft, smooth, shiny, healthy and manageable with the first few uses. With continues usage for few weeks, my hair fall almost stopped (I lose 3-4 strands each time I comb my hair!) leaving my dry ends soft and hydrated. It also helps in reducing hair loss, hair thinning, promotes hair growth and prevents pre mature graying. I could actually see a visible difference in hair growth after using this oil. It is 100% natural and organic oil and can be used daily. It nourishes my hair really well and imparts a healthy shine to it. It contains olive oil, avocado oil, almond oil and other certified organic ingredients. It is 100% organic, paraben free, sulfate free and gluten free. It is so light that it can be used as hair serum too! • Penetrates deep into the hair shaft. • Prevents hair loss and removes infection. • Paraben, sulfate and gluten free hair oil. • Old Wives Tail provides free worldwide shipping. Overall I am super duper happy with Old Wives Tail Anti Hair Loss Hair Oil. It is quite light with an amazing soothing scent. It leaves my hair soft, smooth and silky. I have quite dry ends but I love how it makes them soft after washing my hair. It reduces hair fall to a great extent due to the presence of organic ingredients. It is 100% organic and is worth every penny. I would HIGHLY recommend it to everyone! 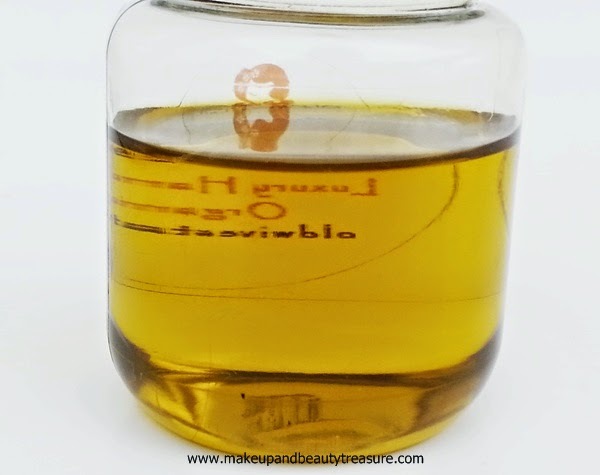 Have you tried Old Wives Tail Anti Hair Loss Hair Oil? How was your experience? Share in the comments section below! Agreed Jhilmil! I am so loving this oil! This looks an amazing oil, lovely review Meghu. It is Aroo! Thanx so much dear! Sure will do! Thanx for following me! Thanx Anita! Yeah all are certified ingredients! My reviews are all honest Purva! U can believe them! Thanx dear! Do try :) Aww thanx so much! The name of the brand is interesting.. Lol.. bt the product is good.. availability is a problem too! !